When I completed writing about Grahan(I forgot to mention – Ht. 7700 ft. (09 kms)), I thought the post on Padri would be small, that nothing extraordinary had happened that day. But I had forgotten the most unexpected even that happened that evening. I will come to that when time comes. By now we were accustomed to sleeping in the tents and woke up the next day feeling fresh. After doing the default activities of the day, we had tea and handed over the sleeping bags and the rugs, then had breakfast (Forced to eat, c’mon you can’t feel hungry so early but have to eat to have the energy). 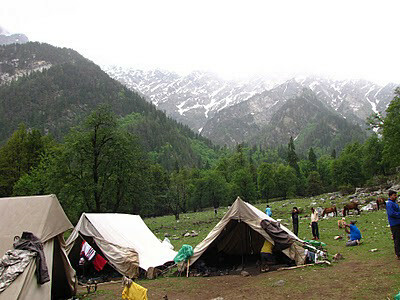 One of the Bhabhis of our tent was suffering from fever the previous day and as she was unwell, she and her husband decided to go back to Kasol with a guide and withdrew from the trek. So we were reduced from 52 to 50. The two [Sardar] uncles (guess I haven’t mentioned them before) and another guy decided to hire guides to carry their rucksacks for them. We formed the usual lines (rest of us carrying our own rucksacks) when counts are taken and off we set again. I slipped a lot of times as we went downwards due to the muddy path and was unsure of my footing. Finally Shyam came to the rescue (He is a Sherpa and the slippery mud doesn’t work on him) and saved me from falling numerous times. By the next day he had helped me so many times that I had to take him off my hit list 🙂 :(. Finally we reached the river below and had a refreshing drink and filled our bottles. The water of Parvati river is delicious. It is so sweet (not the sugary sweet, you know what I mean) and pure and unadulterated. It tastes just awesome. That water is life. Off we went again following the guide’s path, talking, joking, discussing random things, photographing, taking short breaks, having glucose (Its very important to carry glucose). Finally reached the lunch point. At lunch point, we could see a distant mountain partially covered in snow. 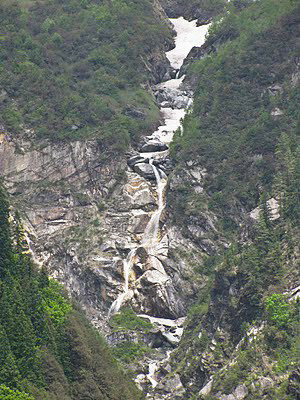 The amazing thing was half the mountain was snow and from that point downwards the snow melted and flew down as water. There were a few trees struck by lightning. There was 1 tree which was hollowed on 1 side because it was struck by lightning but it was still alive and had his branches green filled with leaves :). Amar, Nikhi and I set off again but after covering a distance I realized that I had forgotten my wooden stick (Stick is the life line here ). So I told Amar and Nikhi to carry on and I went back for my stick. After getting the stick, I set off again with Sandeep, Vikas and Shyam. As the campsite was only a little distance away, we hoped to reach it before it started raining again. Alas that didn’t happen but the rain we were caught in was not as much as yesterday when we were trekking and soon reached the campsite. We got into our respective tents and soon heavy rains started pouring. 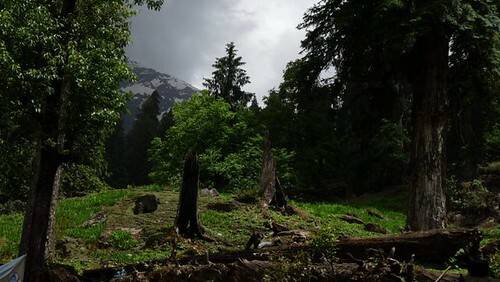 The rains in the mountains are fast and hard and accompanied at that height and above by hailstones. From my tent door flap I saw the rains and the hailstone, caught a few hailstones. It looks so nice :). When it soon stopped raining, Nikhi and Amar along with the some other girls chose to remain inside the tent due to the cold(They would come out soon though 😉 ) and I felt just the opposite. I wanted to be outside as much as possible enjoying the mesmerizing beauty of the mighty Himalayas :). If it was beautiful before, after the rains it looked even more beautiful. 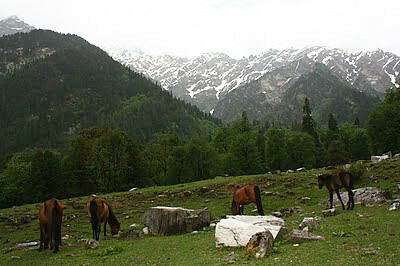 There were some mules grazing away and the view of the mountains looked majestic. It was larger than life :). Any words I use to describe it would do it injustice. 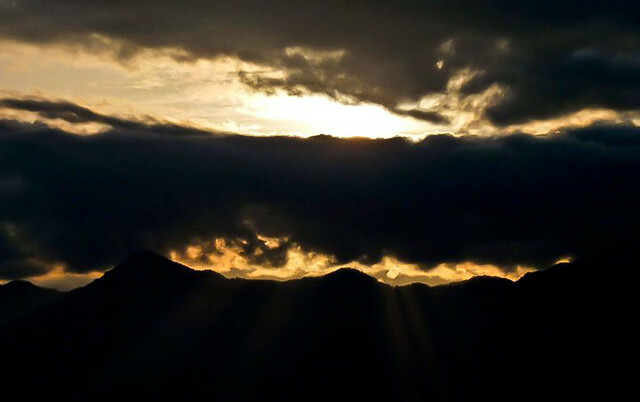 The image is still stuck in my mind 🙂 so beautiful (I know I am using this word a lot), so mighty, partially covered in cloud, oh yeah the clouds are at the same level as peak of mountains or below. The simplest comparison I can give is this: I had only seen snow capped mountains in movies before so imagine sitting in a theater and the movie screen multiplied by 10 in height and by 10 in width and imagine the mountains on it. But more real and more beautiful and you are there smelling it, seeing it for real 🙂 🙂 :). I turned and I saw Pranav sitting on a rock, writing something in a notebook (Probably a love letter to Pintya 😛 ), there was Shyam clicking some snaps and further were Naveen, Keerthi and Manju. Keerthi with his 2 kg tripod was capturing the mountains(I still didn’t know then about his craze and talent for photography 🙂 ). 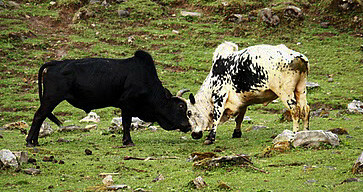 As we stood there watching and talking, soon we saw a white bull coming in our camp site and a black bull which belonged to the camp site started fighting with it(or was it the other way around?). It caught all our attention. By now Nikhi and Amar had come out too and we witnessed this awesome bull fight. It was incredible, it went on for a while, watched by us and other bulls some of which were kid bulls. Manju went dangerously close to a rock near where the bulls were fighting, clicking away and Keerthi was lost in photography too. Meanwhile, Pranav who had Keerthi’s mobile bet the mobile(without Keerthi’s knowledge 😀 ) saying that the black bull will win. The camp leader told us that whenever the white bull came the black bull would drive it away, it was possessive of the camp site. Finally the incredible fight was over and the black bull won :D. BTW we also saw some skulls of bulls there :S.
The camp leader had told us not to cross a certain point beyond which were the natives who didn’t like interference and they didn’t want us to step on their stones as they considered the stones to be God. He also pointed out the Nagaru campsite which was atop the vast mountains we could see to the left. He showed us how to locate it with reference to the lunch point which was prominently visible. With the help of camera lens we could locate it and saw most of the campsite was covered in clouds! We were awestruck to learn that this huge distance, scaling to the top of that mountain would be covered in just 2 days!! The SP20 batch which was in Nagaru that day flashed green laser lights at us and we responded in same :D. The camp leader warned us that if anyone wanted to answer any calls at night we should go towards our respective wooded area with a companion to lookout for wild animals and also whistle or sing. After this it was time to get in the sleeping bags. That day I slept at the end of the tent near the door flap. At around 4 in the morning I awoke with a start feeling something against the tent pole. I was scared (what if it was a wild bear, what was I supposed to do? Everyone was zipped in sleeping bags aslee!) but later realized it was a mule grazing the grass nearby :D.
Calvin says, ‘If your knees aren’t green by the end of the day, you ought to seriously re-examine your life’, these were the days of my life where my knees were literally green and I need not re-examine my life one bit :). I could identify with your observation about the first sight of mighty snow clad mountains, it's simply memorable. Recently, I was amused to see a similar expression from an Afghanistani colleague who stood speechless in front of the Bay of Bengal because he had only seen beaches and sea waves in Bollywood movies! I am yet to see snow, but I remember the first time I saw the sea. You go up a street and then you get a feeling that there is nothing beyond.. and then you hear the waves..and then you sea the mighty body of water, smell the salty air and feel the awesomeness that its all about. That was a long time back on the beach of Digha in West Bengal. Hope the snow clad peaks bring the same feeling.